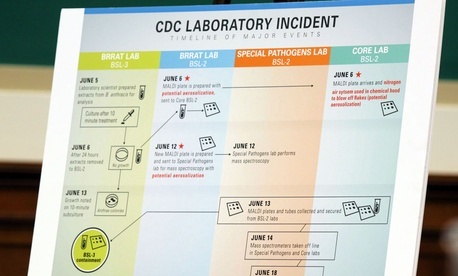 The head of the Centers for Disease Control lab that exposed workers to live anthrax and deadly strains of bird flu by improperly transporting them resigned Tuesday. Michael Farrell, who had run the C.D.C. 's Bioterror Rapid Response and Advanced Technology Laboratory since 2009, was originally reassigned after the incident. Last week, C.D.C. Director Tom Frieden told a congressional oversight committee that the C.D.C. would take disciplinary action where it was needed. "With the recent incidents, we recognize a pattern at C.D.C. where we need to greatly improve the culture of safety," Frieden told the committee. "What we're seeing is a pattern that we missed, and the pattern is an insufficient culture of safety." Equipment failures included broken or nonfunctioning machinery, the failure to use filters or replace filters on a regular basis, the use of equipment that was not sufficient to contain the select agent or toxin (e.g., equipment used on a laboratory bench top instead of in a biosafety cabinet), and biosafety cabinet grilles obstructed with pens or other items..."
An internal investigation revealed that safety lapses at the Atlanta laboratory were responsible for the to failure kill the bacteria before sending it to two other labs. Earlier this month, the C.D.C. placed a hold on shipping dangerous pathogens.